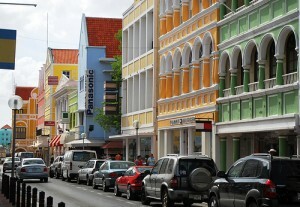 WILLEMSTAD – The concern that exists in parliament that downtown Punda is becoming empty is legit, but the location of the new central building for the government will not depend on this concern. This is according to the Minister of Finance, Dr. Jose Jardim in parliament recently. Jardim said that it’s not true that the city centers, Punda and Otrabanda, are becoming empty just because the government is taking out its services from that area. There is an analysis which shows that there has been various empty buildings in downtown for years now. On the other hand, the Minister hopes that before the end of the year they can present an attractive fiscal arrangement for people and businesses to move to the city center and bring back life to the city. Recently parliament continued a debate on the construction of the new central building for the government. One of the arguing points is that the government should not take out its services from the downtown area, because this will be disastrous for the businesses in both Punda and Otrabanda. It will make it even emptier than it already is. Jardim said that it is not true that the government is moving its services to the public somewhere else. The Council of Ministers, Parliament, Department of Justice and Customs, for example, are all in Punda. According to the Minister the services that need to be together will be moved out of downtown and put together in a central building. This is to help the government reduce its cost of operations, which will also improve its services. In total there are 19 government services in Punda currently. When the central building is finished, there will be 11 left in Punda. In the central building there will be a total of 1500 civil servants working. Of the 793 civil servants that are currently working in Punda, about 450 of them will stay once the central building is finished, Jardim said during his dissertation in parliament.